As announced during synergy UPM will be introducing Roaming OST & Search Index , below on Citrix Synergy TV Session SYN231 (from 22:01 onwards) a demonstration of the feature. This version includes the following new feature and addresses several issues to improve the user experience. This new feature allows for a native Outlook search experience by automatically roaming Outlook search data along with the user profile. For details, see Enable native Outlook search experience. Noticeably missing from the “Whats new” for Profile Management is Outlook OST is included in 7.18 which seems rather strange as it probably a bigger draw for people than Outlook search. As indicated by Carl Stalhood tweet, a patched 2016 server is not actually supported, but there appears to be private hotfix required to support the new Windows Search Service version but actually the roaming still works with this message appearing. Step 1: Install Profile Management 7.18 (Can be found on XenApp_and_XenDesktop_7_18.iso, under x64/ProfileManagement or will be installed with VDA 7.1 if profile management is already installed) by launching profilemgt_x64.exe and follow the default prompts. If you have upgraded your VDA to 7.18 . UPM Component will automatically be upgraded 7.18 as well. Step 8: Reviewing Computer Management/Disk Management confirm you see the two VHD’s attached. Step 8: After mailbox full caching is complete , All folders are up to date will indicate this. Step 10: Open Indexing Options – Outlook -> File, Options , Search , Indexing Options and confirm Search index is not re-indexing and is already complete. Robert Steeghs has written a great article on permissions required and how the computer account is used when accessing the VHDX. Thank you for the article. I understand that people were relying on the FSLogix containers for Outlook in the VDI environments as configuring outlook through UPM and GPO had corruption issues with big OST files. So will this replace the above and can be done through UPM? Yes this will help solve the outlook OST cache like fslogix although they cover additional elements of Office365 such as one drive etc. But if your looking OST then yes it will solve your issue. Hi Just downloaded UPM 7.18 and installed on a 2012R2 test machine and used the updated ADMX to configure UPM enabling the search index roaming policy setting but when creating a new Outlook profile with cached mode on the VHD folder gets created within my profile on my UPM store but the VHDs dont get created and mounted next time i log on. Does this support 2012R2 ? Windows 10 1709 and Server 2016 only. Hi, I have it running happily on Windows Server 2012R2. The searchindexer version 7.0.9600.18722 from 18/12/2017 is on the supported list. Running Office 365 16.0.10730.20102 at the moment. Official position from Citrix is that support for 2012R2 is still being validated…..no timeline is given. My take is that it will never happen. It buys us some time to get a better performance until we switch over to a 2016 desktop. We have a number of clients that have apps that are not 2016 supported. My worry is that it stops working after a next Windows or Office update…. Well done, very nice summary, but I cannot understand the benefit of this feature. When I implement Outlook in VDI/RDSH, I disable the Cache Mode in the past. If someone is out of office an needs access to received mails when he is offline, I see the advantage, but using Citrix forces him to be online anyway and in this case I do not need the cache mode to survive. After all, why use this feature and increase complexity? This feature is relevant when Office365 is being used as cache mode is recommend due to latency between user/mailbox being increased and is reliant on internet stability. Exchange on-premise would not need the cache as it will usually be within the same data centre and very low latency. Thanks for the blog, followed instructions and have this working for primary mailbox.. but with shared mailboxes the search index is not working? can any one confirm if this works for shared maiboxes? and if so how? Apologies , i thought i had replied to the shared mailbox. You need to add an extra mailbox in Account Settings within Outlook Options. Once it is added ensure it is being cache (as by default it will be online) and another OST will be present in the LOCALAPPDATA folder where OST reside. So it uses the same vhdx file for all OST files? When a user logs in, it splits the vhdx file and copies them to %USERPROFILE%\Appdata\Local\Microsoft\Outlook? Using PVS with cache to RAM and overflow to disk, I thought I would see an increase in the cache size because it’s coping to the local C Drive, in the test environment I didn’t see any increase. Do you know why? Hey David, I’m testing and I noticed that the option to highlight search terms in the results is still greyed out. Is this meant to work now since the windows search service is installed? Hey David, Is this option available for you? can you send me a screenshot to david@wilkyit.com and i’ll compare against mine. All good. it does work. Hi, how did you solve this? Our users can’t use advance search. And if I check Indexed locations i can’t see Microsoft Outlook. If i use “Show all locations” in Indexed locations i can see my admin accounts outlook profile. The VHD:s is attached and the mail is retained between logins. Do you know if there will be a support for O365 x64 version ? Little confused on the not supported on multiple sessions. I am assuming this mean going from 2016 and then logging into a windows 10 vda at the same time? Or going back and fourth between the two? Or is this saying not supported on multiple sessions on the rdsh with multiple users? Thanks and good write up as well. I follow ur stuff. Good work man. Concurrent session, for example if you want to have two windows 10 VDA’s running which would essentially trying to mount the same VHD this won’t work. There is separate VHD’s for OS so you could have a windows 2016 VDA and a windows 10 VDA running together but they would be accessing separate VHD’s. Thanks for your feedback. Ok I see now. Thanks for that break down. We use windows 10 1607 LTSB due to all the issues I read with Microsoft and Citrix. But it appears this is not supported. But curious if it will still work? It needs to be a certain version for index support, but to be honest it also works with newer version of index(maybe a bit of covering themselves). As long as have you have the right version of UPM i can’t see why it wouldn’t work but if it is listed as I supported it would be a test only. Does this slow down profile load? Just seems like when logging is the part that said loading Citrix profile manangent is longer now. Used to zip by before I enabled this feature. It will slow it down possibly for a second or two while the VHD is attached during login but nothing significantly. What is the difference you are seeing? Can you review logs to see where the delay is? It’s about 7 seconds now. I’m looking in the UPM logs. 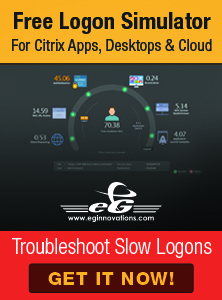 Couple things Citrix stated. I needed to install this feature on the 2016 server. On the Features page, select Windows Search Service and then click Next to intall. Its supposed to be a VHDX file not a folder with a arrow on it. Feature troubleshooting •Ensure that the Enable Search index roaming for Outlook Profile Management policy has been enabled. This policy enables both the Outlook search index feature and the Outlook cache (.OST file) feature. •Check that the Outlook cache VHDX file and the Outlook search Index VHDX file have been mounted and appear in Windows Explorer as VHDX mount icons. If they show as regular folder icons, the VHDX mount failed. So I am going back and following these 2 articles. Thanks the feedback, the citrix documentation has improved since this was written shortly after the feature was released many months back. Can one of you guys confirm if your getting folders with arrows or drives with arrows? They keep saying it supposed to be drives with arrows, not folders. George Spiers has folders with arrows as well. Figured I would ask another source. Citrix is know to be wrong a lot at times. About ready to say forget this shiz and buy some fslogix. I have seen it done with both. Drive with shortcut and Folder with shortcut. Microsoft UPD uses folder with shortcut as i did an article with a screenshot. Tested it again with Citrix UPM and it is Drive with shortcut! Hope this clarified it for you! I don’t think you can buy FSLogix anymore since it was acquired by Microsoft. We use Citrix UPM. So now I’m curious why it’s not showing as drive with shortcut. Wondering if it’s something to die with tuning the os and turning off the aero them and such. Appreciate your time as well. I would say that’s very likely. I tested on a windows 10 /2016 untuned with drive icon. I wouldn’t worry too much as long as it is mapped. I wasn’t too aware of icon status of drive or folder to be honest and just looked out for the shortcut. Previous environments where all tuned environments and I don’t remember seeing the drive. Oh on the fslogix. Curious how I can get it now? I can ask Christian Brinkhoff as well on fslogix. Hey David, thanks for your time bud. Does the OST roaming support in Server 2012R2? I mean Citrix_UPM_Disk is mapping.